If saving for retirement is new to you, you may wonder why you should enroll in your 401(k) plan. What’s the point? Money doesn’t exactly grow on trees, so why should you live on anything less than 100% of your income? As you begin to learn about your 401(k) plan you might hear a lot of complicated terms, and you might get the message that the 401(k) is just about making sacrifices: it takes time to figure out the 401(k), and you’ll have to tighten your budget so that you can put money in the plan. Sometimes it’s better to start with the big picture. So let’s zoom out and get a view of things from 35,000 feet. Figuring out why you might save money in your 401(k) plan (or why you’re not interested) is an important step. If you decide that using the 401(k) is a good idea, it will be easier for you to do what you need to do: you’ll have real motivation – your emotions about your dreams for the future – to help power you along. If you never figure out why the 401(k) makes sense, the whole process will feel like a tedious task. The main reason to save money in your 401(k) plan is that you might want to retire someday. If you think you’re sick of working now, just imagine how you’ll feel as you approach retirement age. Calling it quits may sound nice, but it’s not necessarily easy: just because you stop working, it doesn’t mean you’ll stop spending money. You can certainly live frugally in retirement, but you’ll probably need some money to spend on food, bills, and vacations. You might even want to pay for gifts and special treats for your loved ones. Exercise: you can start working toward the retirement of your dreams right now. Take 30 seconds (or more) and simply imagine what you hope your retirement will look like. Aside from “not working,” what types of things which you like to do? Where would you like to be? What types of people do you imagine around you? You don’t have to live lavishly, but you’ll need something to get by. Some expenses, such as healthcare, might even rise if you’re fortunate enough to live to an old-age. Funding the retirement you want will require a source of funds. Again, it might not be much – you just need enough to cover what’s important to you. Where will those funds come from? Increasingly, we’re on our own. To give yourself the best shot at a comfortable retirement, you’ll have to save some money yourself. The idea is to build up a sum of money from which you can pull income during your retirement years. 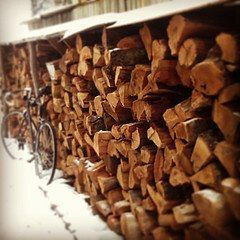 Imagine it as a pile of wood that you build up during the summer, from which you’ll pull a few logs each day during the winter. Retirement accounts like 401(k) plans are one the most powerful tools to help you build that sum of money: they provide tax benefits that make it easier to save and grow your money, and you might get matching money from your employer. While it’s risky to depend on anybody but yourself, there might be some other sources of income in retirement. These sources can make things a little bit easier, but they don’t provide enough for most people to live on. Pension plans: retirees of previous generations could pretty much count on a pension. They’d stop working, but their employer would continue sending money for the rest of their lives. Pension plans still exist, but they are less common and less generous than they used to be. By now, most companies have switched to plans like 401(k) plans to reduce their costs and risks. They no longer promise you a retirement paycheck – instead they put the responsibility on you. You can do the same thing they used to do when creating these pensions, only on a smaller scale and with less room for error. Social Security: Social Security is another source of retirement income. After paying into the system for all of your working years, there’s a decent chance that you’ll get something back in your retirement years. However, the question is how much you’ll get. Nobody knows exactly what will happen with Social Security, but it’s probably going to change – it has to – and it’s probably not going to get any more generous than it currently is. Retirees of previous generations might have lived off of Social Security and pensions, but future generations need to do something different. So, what can you do to start funding the retirement of your dreams? It might not be easy, but it is simple: save enough money to fund your goals. If you don’t know how much you need to save, do some basic retirement planning, and then make adjustments over time as needed. If you’re just getting started, don’t get too bogged down in all of the details. Retirement plans can be complicated and overwhelming. You need to understand the basics of 401(k)s, but you don’t need to become an expert. Trying to time the stock market and picking the “best” investments are extremely difficult to pull off. As long as you pick investments that are a reasonably good fit for your needs, you’re on the right track. Saving money for retirement is probably the most important step you can take. The rest of it is entertainment at best, and expensive at worst. Once you have saved for a while and accumulated money in your retirement accounts, it’s worth keeping a closer eye on things. But if you’re just getting started, the most important thing is getting started.